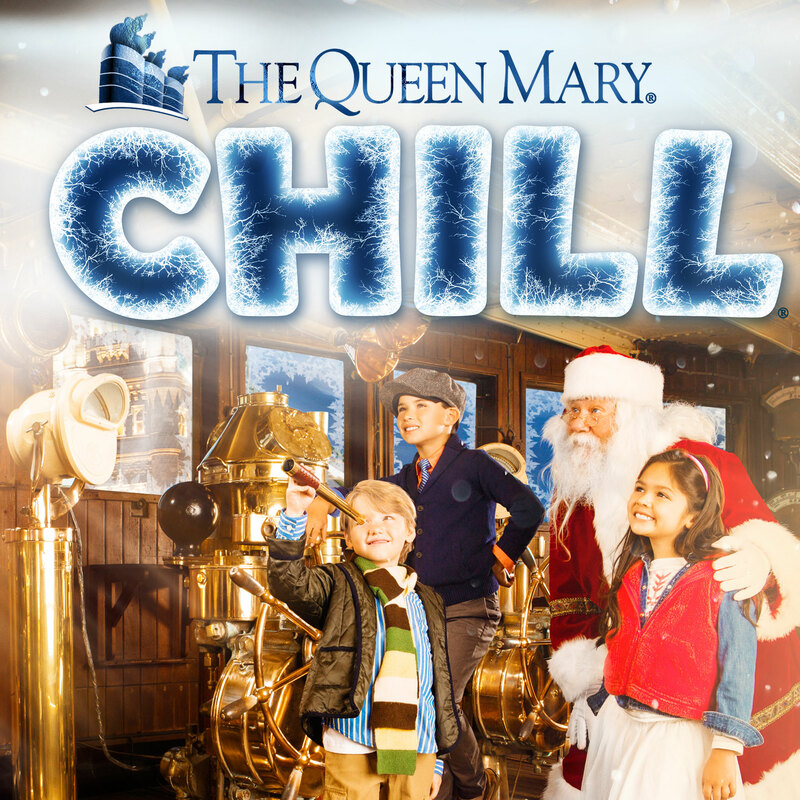 The Queen Mary will once again be overtaken by a deep freeze for the fourth annual CHILL, opening on November 20, 2015. Experience the frozen magic that will bring holiday wonderment and artic temperatures to Southern California. A holiday extravaganza like no other, CHILL transforms over two million pounds of sparkling ice into larger than life hand carved colorful ice sculptures in a giant Igloo called The Ice Kingdom, located inside the Queen Mary’s Dome, once home to the legendary Spruce Goose. The Ice Kingdom will bring Charles Dickens’ classic tale of A Christmas Carol to life with Ebenezer Scrooge and the Ghosts of Christmas Past, Present and Yet to Come frozen in glistening ice. Walk-through chilling scenes from the Nutcracker complete with castles and sugar plum fairies. Get lost in the life size candy cane forest and explore the penguin village. Slip down ice slides off of a 30’ high replica of The Queen Mary and enjoy a festive cocktail at the all-new ice bar aboard the ship’s frozen bow. Each ice exhibit is precisely hand sculpted and created by an international team of expert ice carved from Harbin, China and enhanced with LED lighting to create a visually awing experience. The Ice Kingdom is kept at a frosty nine degrees Fahrenheit to preserve the ice. Guests receive parkas to help protect them from the chilling temperatures. The 4th annual CHILL welcomes back Glacier Glide Ice Tubing with six lanes of glistening ice slides standing two stories tall and 100-feet long in front of the Ice Kingdom. Ice skate under the stars on the 6,000 square-foot ice skating rink with the backdrop of the picturesque Queen Mary ship. A holiday village will offer visits with Santa Claus, holiday carolers, snow days and live festive entertainment. CHILL pricing starts at $34.99 for adults and $24.99 for kids (ages 4-11). Tickets include entrance to The Ice Kingdom, Ice Tubing, CHILL Village and access to the Queen Mary ship. Lodging packages are also available. CHILL will be open select dates Nov. 20 through Jan. 10. For more information, including hours or to purchase tickets online, visit http://www.queenmary.com/events/chill/.